44 per cent more resolution - with no performance penalty. 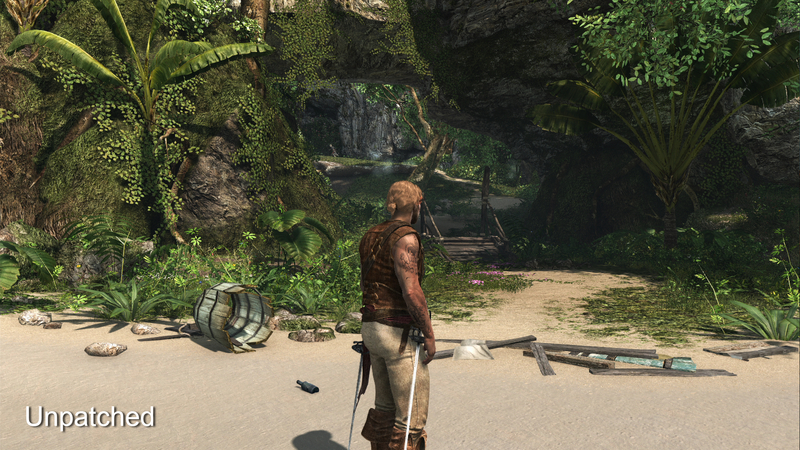 With next generation tools and system resources often in a state of flux before the final hardware is ready for release, game development continues right down to the wire, in some cases with last-minute optimisations and graphical tweaks completed after a title's master disc has been pressed and duplicated for the final release. The end result is that some launch titles are effectively finished via the release of patches and updates designed to fix various bugs and glitches, or to improve noticeable performance issues - as we saw recently with Call of Duty: Ghosts. Ubisoft recently revealed that the PS4 version of Assassin's Creed 4 would gain an update shortly after the game's release, bumping up the rendering resolution from 900p to 1080p, along with some improved visual effects and a new anti-aliasing solution, with all of this possible via further optimisation work carried out after core development was completed. With the patch now available in the US, are we looking at a noticeable upgrade in visual quality, or a more modest refinement to the original, unpatched presentation? We kick off with a 1080p head-to-head video showcasing a number of clips from the first hour of the game. On first impressions, the differences between running the game upscaled from 900p and natively in 1080p are actually quite subtle: there's a slight but noticeable boost in sharpness, and images appear a little more crisp, but nothing that immediately grabs you as amounting to anything approaching a sensational upgrade. The original 900p framebuffer is actually upscaled well to 1080p without introducing much in the way of unwanted artefacts, and the anti-aliasing solution in both versions helps to give the game a smooth appearance. Look closely and the differences become more apparent. We see more fine detail, such as the strands of hair on the characters' heads and the rigging on ships sailing far off in the distance. 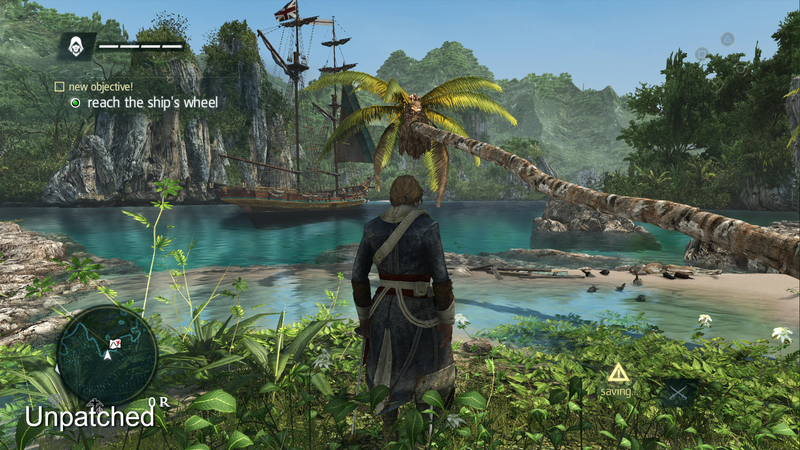 Assassin's Creed 4 on PS4, pre- and post-patch, in a series of direct comparisons. We recommend engaging YouTube's resolution gadget and ramping up the quality to 1080p for the best possible comparison. Sub-pixel imagery in general is more defined and we also see a small increase in texture clarity. At times, beyond a slightly extra bit of fuzziness around the edges of fine objects and a few softer-looking textures, it can be hard to tell the unpatched and patched versions apart - less so in close-up scenes of the characters. Certainly, we expect those with large HDTVs to benefit the most from the upgrade, while those with smaller displays may find it more difficult to notice the benefits. Ubisoft's use of a new post process anti-aliasing solution is also quite subtle, failing to make itself known via a sea of overly smooth edges and imposing texture blur. However, there is a clear improvement, with the main benefits revolving around reducing the amount of shimmering on foliage and fine details, although these elements are still not immune from obvious jaggies in some scenes. Beyond the resolution and anti-aliasing difference, there's little evidence of improved effects work with the update installed, at least from what we've seen in the first hour of the game. The opening few moments reveal what may be the addition of volumetric smoke, but little else stands out as being noticeably upgraded based on this initial play-through. Some elements such as the placement of smoke and particle effects are handled dynamically, so appear randomly on screen according to the battle conditions and the water/wave collision physics, rather than being boosted above what is present before the patch. In this shot we can see how hair and fine details are better resolved with the game running in native 1080p. The boost to native 1080p does provide sharper imagery and extra clarity to texture details, but the impact isn't quite as startling as we expected, although clearly noticeable. Assuming Xbox One does indeed render at 900p, it's a good compromise. Impressively, the increase in resolution and the mild upgrade in visual effects comes without impacting performance in any way whatsoever. We've only tested the first hour of the game so far, but we didn't see or feel any noticeable frame-rate drops, something that was confirmed to us after running a variety of clips through our analysis tools. 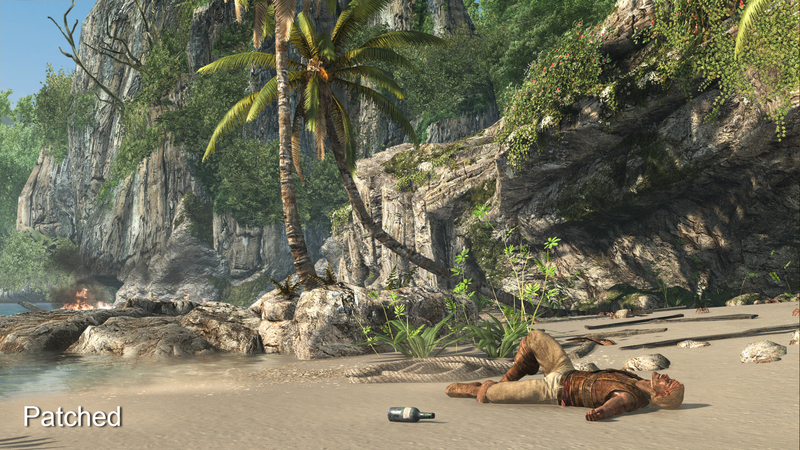 Assassin's Creed 4 operates at what appears to be a locked 30fps without any tearing and dips in performance at all - a huge upgrade over the highly variable frame-rates seen in the 360 and PS3 versions of the game. Despite the solid performance metrics, when frantically running around Havana we still found some of the transitions in animation to be a little jarring. But the cause of this visual phenomenon appears to stem from the game's somewhat dated animation system, which doesn't blend individual motion captured movements together as smoothly as titles such as Naughty Dog's The Last of Us and Uncharted 3. However, the rock solid 30fps update makes the experience feel much better to play than the PS3 and 360 versions, where drops in performance would be hugely distracting when attempting to free-run across buildings in order to chase down a target. 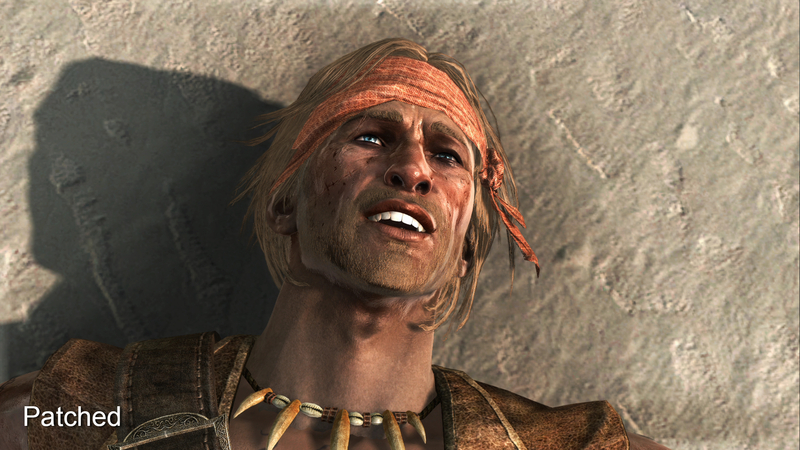 "In our initial hour of gameplay, we saw no difference in performance at all - even at native full-HD resolution, AC4 retains a locked 30fps." 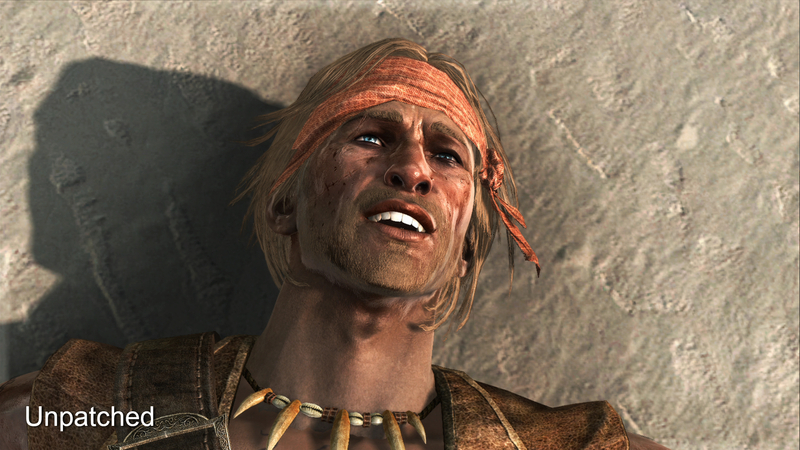 An impressive showing from Ubisoft on PS4. Initial performance tests reveal a solid 30fps with no screen-tear or even mild drops in frame-rate, in both the original 900p release and patched 1080p upgrade. The fact that we aren't seeing any hiccups in smoothness is also rather interesting: it makes you wonder, if Ubisoft are hitting 30fps on such a consistent basis, just how fast would the game actually run on the PS4 hardware if it were not for the frame-rate cap? Sadly, this is something we're unlikely ever to find out, with the upcoming PC version looking like the only one capable of delivering a 60fps update while running at high definition resolutions. Overall, from what we've played so far, Ubisoft appears to have done a great job in getting Assassin's Creed 4 running on the PS4 at a stable frame-rate without any noticeable issues along the way, with the boost in resolution provided by the recent update having no immediate effect on performance. Of course our initial investigation only covers the first hour of gameplay, and we're interested to see if the same standard can be maintained across the course of an extended play-through. This is something you'll be able to find out from our upcoming next-generation Face-Off, where we'll be sizing up just how the Xbox One, PC, and current-gen formats fare in comparison to the promising PS4 code. And yes, Wii U is invited along for the ride, too. Strategies for taking down all five legendary ships in Assassin's Creed 4.